Yesterday, I made a hedgehog that looked more like a little bear. He was a cute little bear, but was not at all what I was trying to make. Lila didn’t mind that the hedgehog looked like a bear and quickly adopted him and gave him a name. 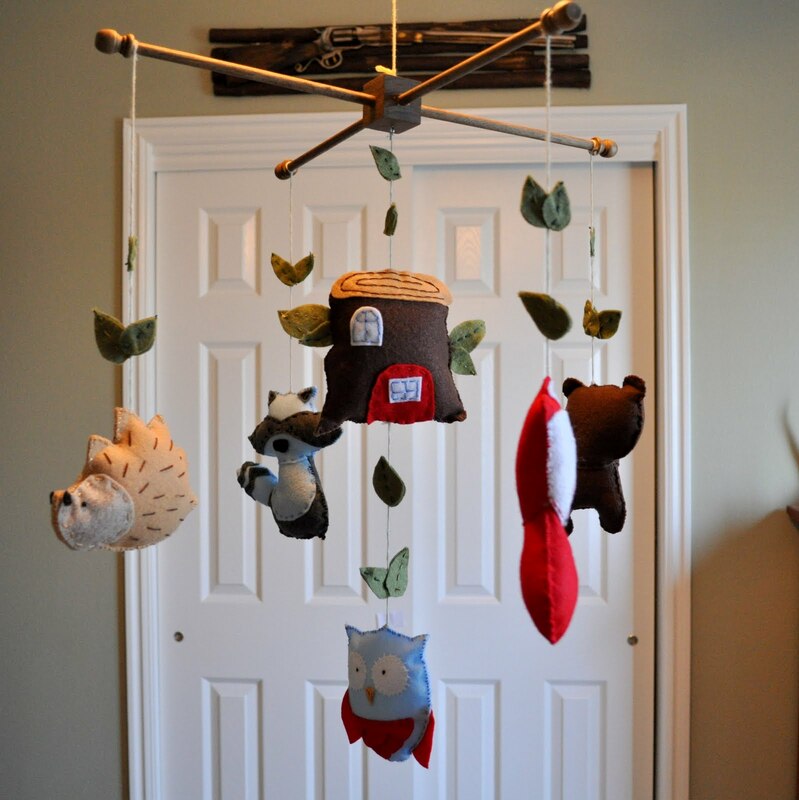 I was pleased that someone would be able to use him, because he wasn’t going to work for the project I actually made him for- a mobile for Nora, like the one below. I kind of expected that I’d have to make more than one, I’ve never really done embroidery before and I didn’t really have a pattern. 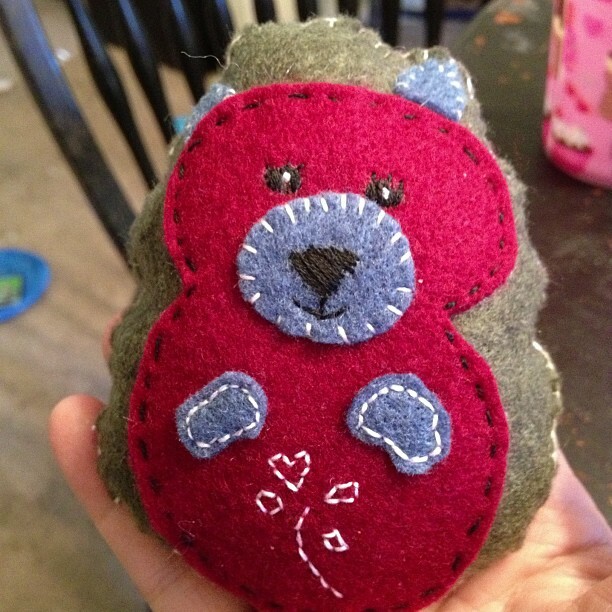 I was glad the bear/hedgehog came out as cute as it did and I decided I’d better make something for Claire too. In the interest of fairness. So, I drew up a quick pattern for a turtle, because Claire loves turtles. 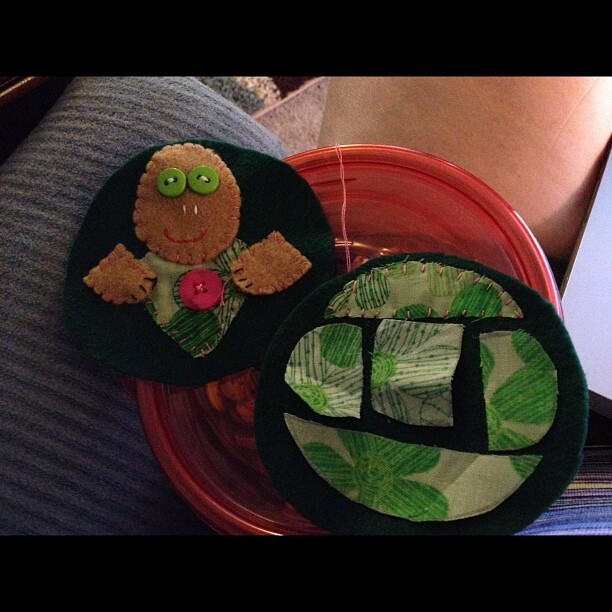 And I cut out pieces, and I sewed and hurried and tried to finish it by the time we left last night so that each girl would have a little toy that I made. I wanted it to be fair. This is as far as I got before we left for dinner with our family in Chesapeake. This morning, I wanted to finish it but I was very busy readying children for the day, changing poopy diapers, trying desperately to tidy up some, searching for the lost library book, drinking my coffee, folding laundry…This was one of those mornings were messes were being made as quickly as I could clean them, babies were poopy one right after the other, the dog was in the trash, shoes were missing, that darn library book continues to elude me…just complete chaos. And, as Lila stepped onto the bus, I noticed that her pants were on backwards. Oh well, now I’m the mom who can’t keep up with the library book and whose kid wears her jeggings to school backwards. But then Lila was off to school and we had a minute to breathe and surely no one else will need to poop and Elmo had transfixed everyone so I could take a minute to sew up this turtle. I finished the front and I showed it to Claire. She said, “Cute.” so I handed it to her for a closer look. And that’s when she started ripping it apart, pulling its arms off, trying to pull its face off. I was so sad. I had so wanted to make this for her, something she could keep forever, something that I designed just for her. Something I put time, effort and energy into and all she wanted to do was rip it to shreds. After I calmed down, took about ten deep breaths and counted to 100, I surveyed the damage. And I had two realizations. One, God gives me beautiful things, special things that He has made just for me. He puts time, effort and energy into the good gifts He gives me. Much of the time, I miss them completely, so bogged down am I in the ‘tyranny of the urgent’. Other times, I wreck the beautiful things He gives me. I don’t nurture them, I rip them to shreds…I don’t see the love and care that went into these things. I am just like Claire. The other realization was this: I can fix the turtle. I’ll have to redo some parts and I’ll have to make sure the thread is more tightly knotted next time but I can fix the turtle. Claire didn’t mean to hurt my feelings when she destroyed it, she’s just…how she is. She’s not quite two and she’s a little bit wild. I can fix this and she will still have her turtle. And so that got me thinking about times in my life where I’ve messed up and God has come behind me and cleaned up my mess and given me back my Good Gift, but this time better and stronger. I can fix the turtle and Claire will still have her little gift and it may never mean to her what it means to me…but I still want her to have it. God wants me to have good things too. Remember? He will not give us stones if we ask for bread. Twenty one weeks today and that means more than halfway done but not yet to viability. And while I know that things are better and that Nora’s chances are much, much, much higher than they were before, I still sometimes feel afraid. A cramp here, a twinge there, a moment of spotting can send me into a panic. Between those stressors and other stressors and just the physical strain of pregnancy at the door of forty…sometimes I have to fight to keep depression out. Sometimes though, God gives me a little, “Hey, pay attention!” and things like this happen and I just have to laugh…just as often. It comes down to this: What am I looking for? Things to be sad, angry, hurt, disappointed or irritated by? 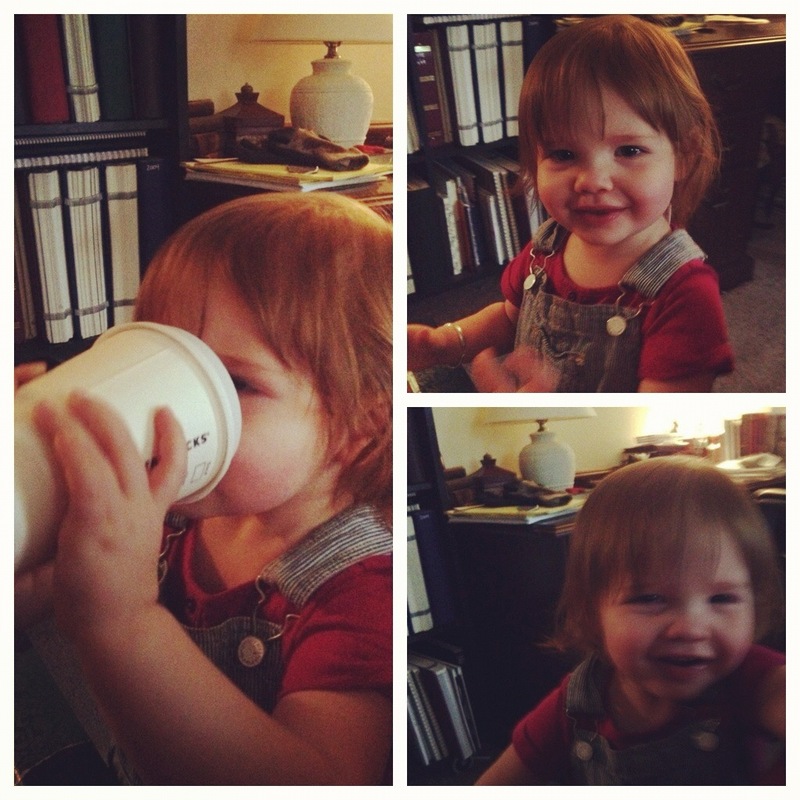 Or am I looking for the gifts- gifts in a laughing almost two year old as she steals my coffee. Gifts in a five year old bounding off of the school bus and saying, “That day flew by!” Gifts in growing up girls who are brimming with life and zeal and enthusiasm, in love with God and life and their friends. And I was thinking about my friend Jen who was with her son at CHKD this week and how she finds the beauty and grace in every day. How she finds the beauty and grace in her suffering, in her son’s suffering. How she just knows that God is holding her and her family. She wakes up each day, clothed with strength and dignity, she goes looking for those new mercies every morning and even though it’s sometimes hard…she refuses to believe that God is anything less than good. She’s not afraid to say that life is sometimes so hard but God is always so good. She’s not afraid to say that no matter what, when He gives or takes away, HE IS GOOD. And some days, I think Jen must have to look pretty hard because her day is filled with caring for a little boy who suffers. And he was once a little boy filled with boundless energy who was into everything and brimming with personality. (He is still brimming with personality, but he’s different now.) I think she must have to really seek the Lord, His presence and His gifts but because she seeks them…she finds them. She does not view her life through a filter of grief, but a filter of grace. I love her. I love Silas. They are world changers. I want to change my filter. Not a filter of fear and worry, but a filter of grace. 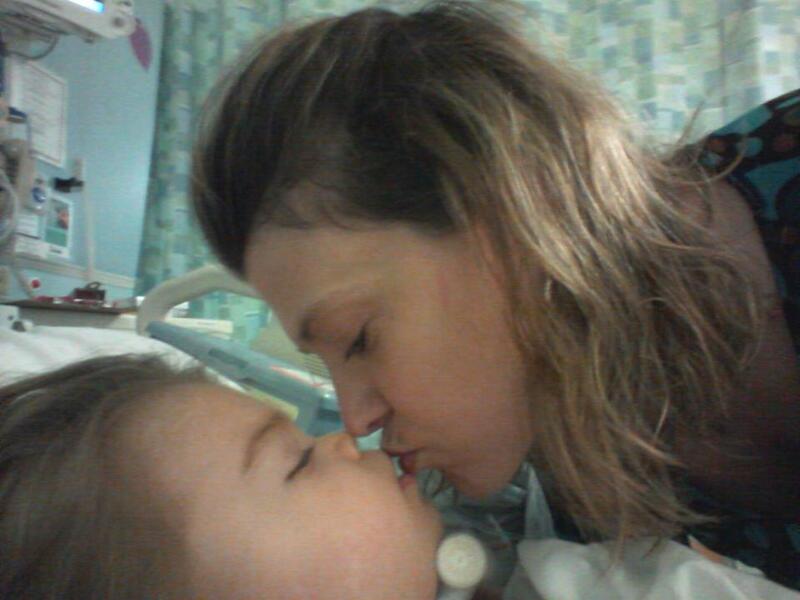 If you want to learn more about Silas and Jen, please go to Caring Bridge and type in Silas Cameron. And it might seems strange…since it’s not a verse about my performance but maybe that’s the whole point. Yesterday, I felt a bit like a failure as we navigated the day. I wrote my blog but after that it just seemed like nothing was going right. Catching the bus was hard, getting to preschool was hard, getting coffee in the morning was a giant fail…just one of those days when all the little things pile up and threaten to knock you right down. Then, the afternoon came and I didn’t plan it out very well. The bus ended up coming early and I wasn’t outside in time and the end result was a pregnant woman running after the bus, yelling, “WAIT! WAIT!” while it drove away. With my child on it. And then I had to call the school and they were impatient with me and I could almost hear the woman on the phone rolling her eyes. Maybe thinking to herself, another mother who thinks being at the bus stop is something she can take lightly. I was ready to cry. Because it hit me right where I’m vulnerable. Right in a raw place…a place of worrying that I don’t measure up as a mom. That place of wondering if I even have what it takes. And that tape began to play in my head of all the ways I’ve failed as a mom over the past twenty years. And that tape got louder and louder and Lila was on a bus somewhere and I was falling apart in the middle of the road. What kind of mom can’t walk the handful of yards from the house to the bus in time? And it’s not like I did it on purpose. The bus was really early, for one thing. It wasn’t due to come for at least eight more minutes and often is later than that. But all the frustrations and irritations of the day plus this? It added up to me pressing play on that tape that tells me I’m the worst mom ever. Fast forward about fifteen minutes and the bus has brought me my child. I think to myself, “Let’s shake this off and go get a Frosty.” Which we attempted to do. But Claire had removed my wallet from my purse and hidden it in the house and so, although we’d driven up to Wendy’s and ordered, I couldn’t get the Frostys. Causing weeping and sorrow and disappointed little ones in the car. Cue the tightening of the throat, the threat of tears and that tape on a loop in my head. Come on, Lord. I said. Help me. I spent the afternoon scolding myself for struggling with these first world problems. Scolding myself for not doing a better job. Scolding myself for not having it more together. Scolding myself for not having a better attitude. No grace for myself at all. And as I was laying in bed waiting for sleep to come and for the very bad, no good day to end…God whispered to me. I am evil and need my Savior. I am a mother who would not give her children or the ones in her care stones or snakes…I want good things for my little ones. And God wants good things for me. He doesn’t want me to beat myself to death for mistakes and for my failings. He doesn’t want me to shame myself. He doesn’t want me to play that tape anymore. Because I am redeemed, I am living out the calling He gave me. I am enough for my children. I can do this. He has good gifts to give. He loves me. And even when the day hands me stones and the world hands me snakes, God has bread for me and He has fish for me. He has gifts to give. Gifts that I missed yesterday because the day won and I lost and I didn’t remember to be thankful. I gave myself no grace. I gave myself no mercy and left no room for the counting of joys. Sammy and the baby dolls. He loves the babies. He wraps them in blankets, pushes them in the stroller. And sometimes, Claire even lets him do this in peace. Lila’s hug when she finally did get off the bus. Do you know it never occurred to her that I wouldn’t be there? That’s not a possibility in her life. She is secure and sure that her mom will be there. Nora’s little baby taps and kicks and hiccups. I only just started feeling her move a few days ago and she hit the ground running. She’s a busy baby and every moment fills me with love for her. David’s dimples. They never fail to make me smile. David and I’s trip to Walmart for his birthday present- a noisy truck and watermelon gum. He loved being able to pick for himself and he loved that it came in a bag just for him. Pictures of my little nephew. He is a bolt of sunshine and love. We did not know how much our family needed this little nephew until he arrived. Why didn’t I remember to count those things yesterday? I chose counting the stones that life handed me yesterday, not the bread that God gave. And then I had this thought: I’m not the only mother that days like this happen to. Don’t we all have a tape that plays on a loop and tells us of our failings? Don’t we all have days where we’d love to press reset and just start all over again? Don’t we all screw up sometimes? Haven’t we all been late for something or forgotten something altogether? It’s not all hugs and kisses and reading stories. Sometimes, all day long is hard. And, I have the power, tools and resources to make the next day a better day. I woke up with Matthew 7:9-10 playing on a loop. I woke up with those fresh and good words in my heart. I woke up longing to find the gifts of the day, the jewels He leaves me, the joys that can be found in the everything that’s around me. Today will be a day of remembering His goodness and His gifts. Today, I will count the bread, not the stones. Will you count with me? Leave your list of gifts in the comments section. We’ll give it to God like a big offering- an offering of thanksgiving and praise. 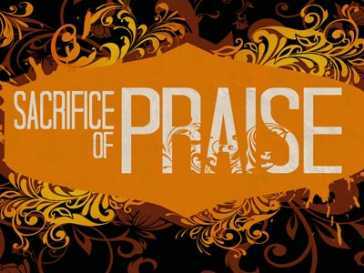 A sacrifice of praise even. We’ll sacrifice our desire to complain and feel frustrated and we’ll sacrifice our usual routine of beating ourselves up. Share your joys with me and with our fellow moms and dads and other readers. I maybe didn’t realize how much I was walking on eggshells until after I’d been to EVMS on Friday. Nine months later, I found out I was pregnant- May 20th. July something or other- met with my o.b. and we agreed to give up on bed rest since I was past the first trimester and bed rest didn’t seem to be helping anyway. Baby A continues to do well. August 17: We discover (at EVMS) that our baby is a daughter! August 30: Another EVMS ultrasound shows that our daughter, Nora, is healthy but her placenta has some issues- placenta previa and possibly the very scary vasa previa. But then we had the appointment on Friday and only good came from it. Nora “passed” all of her screenings for genetic problems and she was perfect on the anatomy ultrasound. She measures just right and has all the things she’s supposed to have and she is just fearfully and wonderfully made. My hemorrhages have dwindled to just a few small spots. My placenta previa is still present, but mostly seems to just mean that I’ll have to have a c-section…which was already planned for. There was NO vasa previa that they could find and vasa previa was the biggest threat to Nora. This means that the rest of my pregnancy MIGHT PROGRESS NORMALLY! It means I can breathe easier. And I am breathing easier. I’m feeling like making plans and making preparation and dreaming about this sixth baby as though she will actually come. It feels more real now. I am so thankful for all of the prayers, good thoughts and cheerleading that my community of family and friends has given on our behalf. I am so thankful for the thirty five meals that were brought to my family while I was unable to care for them myself. Every text, email, Facebook message, call and visit…I just don’t have words. We are so thankful. My husband did my work and his own too. He took care of the house and the children, the dog, driving big girls here and there, praying for me…he did it all without a word of complaint. And now he says he has a greater appreciation for the trials of the stay at home mom. And so, this morning…I am thinking about all of this. The loss last summer, the pregnancy and all that’s come with it, other trials we’ve faced…I’m overcome with gratitude that this time, God has given us back our baby and He has chosen healing. But more than that, I’m grateful that He is who He says He is. And that even though I’ve seen loss, even though I’ve suffered trials, He never changes. I can stand on His word, His truth, His promises. No matter what storms may come. 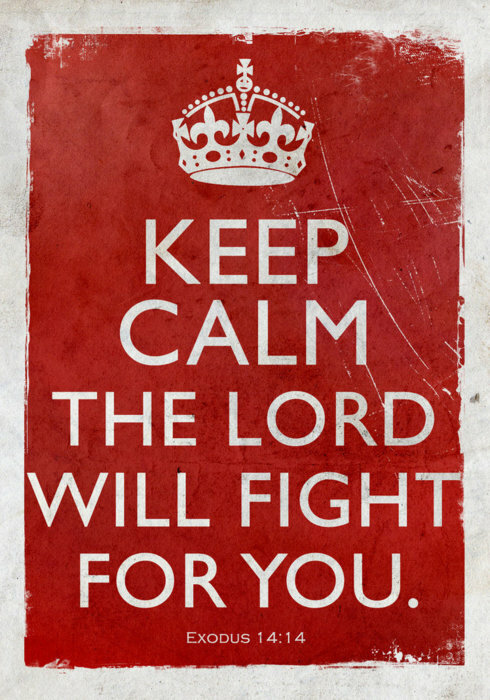 He is not going to just give me the outcome I want if I pray hard enough. But He is going to stand with me through whatever comes. I will raise the banner. He is good. Always. And I’ve learned to say that when He gives and when He takes away. When I get what I want and when I don’t. He is good. This morning, even if I’d had a different result at the appointment on Friday…I would still raise the banner. He is good. He never changes. He is love. Hard things come, the Bible promises they will, but the Lord is with us. He is with me. He is with Nora. And I am so grateful that I had a good outcome to report and I absolutely attribute it to His healing power and presence in my life. Don’t you think sometimes that life is all about things not working out the way you think they will? We talked all day of getting to bed early last night because we were both so tired and so in need of an extra hour or two of rest. We had all of these plans but still managed to get there late. Then, this morning finds us sleepy and scratchy eyed and praying for endurance. Little girls took turns waking up through the night and were uncharacteristically hard to settle. Our bed was filled with flailing little arms and sharp knees and sleep was elusive for all. Coffee was gratefully received as we rose before the sun and got ready to take on the day. This happened mostly, I think, because I made the mistake of saying aloud, “I’m so glad they’re good sleepers.” Anytime you think you’ve done something right in parenting…the children do their best to make sure you remain humble about it. I’ll be looking ahead to nap time with great expectation today. Oh, but life is good. Through sleepy eyes I open my Bible and thank Him for daily bread…for the morning…for making it to the halfway point with our little Nora safe and sound so far. I wanted to choose crankiness and Poor Me this morning but you know what…I don’t think I will. There’s too much to thank Him for. Sam and Claire hugging and dancing instead of fighting and crying. Aubrey chasing Claire through the living room and the laughter of both. And so much more. It’s so easy to choose complaining. It’s so easy to choose discontent and frustration. And we’re all human. We’re going to fall apart some days. But I think maybe it’s just as easy to choose thankfulness. I’ll probably have to make the decision many times today. It’s not a one time deal. It’s a process. A process of learning to see the beauty in the day to day. A process of learning to laugh at your circumstances. A process of learning to surrender your own wants and desires and being fully present in the moment. A process of using those fresh mercies that God offers new and beautiful every morning. And I laugh. I say no, but I laugh. His grace is sufficient this sleepy morning. The thing about asking the Lord for help is that help will come. He sends help in all kinds of ways. Hugs from tiny, sticky arms. Unexpected chores done by almost grown daughters. The gifts of company and coffee from a friend. A hard working husband who comes home from work and does more than half of dinner prep, kid wrangling and the bedtime routine. A cozy nap during a big rain. After school chats with people I love. Blog comments and emails from dear ones who speak love and encouragement and yes, I get it. I understand. Scripture read on the Facebook walls of faithful women. I think these two verses must become the theme of my life in this season. Give Him thanks, He deserves it. 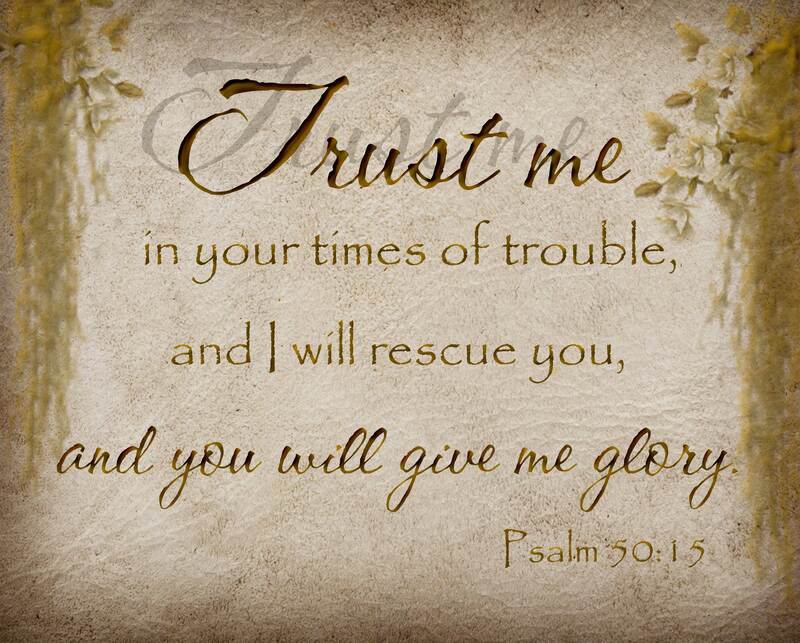 Call upon Him in any kind of trouble and He will be faithful to come. And then you give Him thanks again. What a glorious circle to dwell in. Today, I began the day with thankfulness. I began the day with the right focus. Still, pray. Pray for healing for me. Pray for health and wholeness for Nora and a safe, timely delivery. Still pray that anxiety doesn’t win, that Discouragement doesn’t sneak in my back door…because she is always there…sometimes knocking and sometimes just lurking. I don’t want her to win. I don’t want her to come in. I want to be found faithful…and I want to be caught in a circle of thankfulness and praise. This morning I read on Facebook that my third grade niece’s anxiety was kicking up and she was having a hard morning. I wanted to call her and tell her, “I totally get it. Let’s hide from the world and watch Cake Boss all day today.” But of course, we can’t do that. I have little ones that need me, a messy house to clean, food to cook, buses to catch, blogs to write and a life to live. I have a faith to walk out too and some days that is harder than others. I woke up and my heart was as messy as my bedroom. Anxiety, stress, worry…all lurking in corners like the laundry piled up. I had prayed the night before and went to bed peaceful…I don’t know what happened in my sleep to cause that peace to flee. I worry, I worry about so many things. I worry about funding for the Good Samaritan orphanage. I worry about funding our family and our household. Seems like expenses grow but income doesn’t. I worry about Julia’s safety when she’s not at home. I worry about the big girls learning to drive- alternating between concerns for their safety and fear that they may never drive. I worry about Lila at kindergarten because she’s there all day and I don’t know what’s going on. I worry about Claire. Will she have tantrums every day for the rest of her life? I worry about Nora. Will she be born at all? Will she be early? Will she be healthy and whole? I worry about this pregnancy and hemorrhages and placenta previa and vasa previa and all that those things mean. Will I have to be hospitalized? Will my history of preterm labor become a present day concern? And I don’t want to worry. I know what the Lord says about worry. Who, by worrying can add one hour to her life? Consider the lilies…the birds of the air…has not your heavenly Father cared for them? How much more will He care for me? But sometimes I feel powerless to stop. And that’s when I relate most to my little niece. Because it’s like my heart goes back to eight years old and I feel afraid and out of control and even sometimes a little hopeless. It’s the truth. When I was in counseling, I told the doctor how I would help my niece. I told her that I encouraged my niece to ask the Lord for help. That I encouraged her to keep her gratitude journal. That I encouraged her to do deep breathing until her stomach would settle and she felt more grounded. And there have been times when my niece has said those things back to me. So, today, I will take my own advice. Even now, while Claire has a tantrum because I won’t let her eat the whole box of doughnuts that Meema brought over yesterday. Even now, when my heart isn’t in it because it’s all just too much. Even now, when the words feel hollow as I say them…they are just acts of obedience and my heart will catch up.